The Caring Network arranges discreet mobilization of appropriate resources of the Parish and its members for the assistance of members and friends beset by personal emergencies. The committee on ministry supports the overall ministry of First Parish and the specific work of its ministers. The committee reflects, shares and discusses pertinent issues related to ministerial work in both the church community and in the local community. The committee offers support and guidance to the ministers when needed and acts as a conduit for information between the congregation and the ministers. The Denominational Affairs Committee seeks to tie our Congregation into the larger world of other UU Congregations. The Unitarian Universalist Association of Churches (UUA) was formed in 1961 through the consolidation of the Universalist Church of America and the American Unitarian Association. Today the Unitarian Universalist Association is a faith community of more than 1,000 congregations that support each other and bring to the world a vision of religious freedom, tolerance and social justice. Our congregation is just one of many! And it is an honor to be a part of this free association of congregations. As part of our connection to the greater UU world, First Parish sends a per member payment each year to the UUA and the New England Region of the UUA in the full amount requested, making us an “honor society”. In return we receive support through presentations, workshops, and services that help improve local church planning, programming and administrative operation. Denominational Affairs acts as liaison between First Parish Bedford and the New England Region of the UUA, which contains 231 congregations. We also send annual dues to the UU Urban Ministry. Denominational Affairs also recruits delegates to represent First Parish at General Assembly, New England Region, and UU Urban Ministry Annual Meetings. The committee also serves as the link between the congregation and issues to be discussed annually at General Assembly. Anyone who is a member of First Parish may volunteer as a Delegate to General Assembly, (to be approved by the Parish Board,) and of course, input for GA is always welcome. Funding for workshop, events, and GA is available. In order to facilitate management of the church’s endowment funds, there is an Endowment Committee of the Parish reporting to the Parish Board, acting in spirit much like “trustees” for the endowment, but subject to the Parish Board and the final authority of the congregation. It is a standing committee, with members appointed by the Parish Board. The Committee will consist of four (4) regular members, to include a Chairperson and three (3) members-at-large. The Treasurer will be the fifth member (ex officio) participating in meetings at least quarterly. Terms of Committee members will be for two years, except initially, two members will be appointed for one year to overlap terms going forward. The Chairperson will be elected from the members. the nature of major decisions which will be brought to the Parish Committee and/or congregation. The committee will have the authority to make investment decisions for ongoing management of in-vested funds within the established policies approved by the Parish Board (as described above) and subject to restrictions by donors. It will maintain documentation on the source and restrictions of restricted funds. The committee will advise the Finance Committee and the Parish Board as to the achievability of funding part of the church operations from the endowment from the perspective of maintaining endowment health. The committee will meet jointly with the Finance Committee at least once a year in preparation for the annual budget and to get input from the Finance Committee concerning investment policy. The committee will hold regularly scheduled meetings, at least once a month, at an announced time and place and shall maintain a written record of their transactions. All meetings shall be open to parishioners. All decisions of the Investment Management Committee shall be by majority vote of those present with the provision that a quorum of three (3) members be present at the taking of any such vote. The Finance Committee consists of six (6) or seven (7) members, to include a Chairperson, Treasurer as ex officio, Chairpersons of the Canvass Committee and Investment Advisory Committees, and one (1) or two (2) members-at-large. The Finance Committee oversees the financial matters of the Parish, under the oversight of the Parish Committee. Maintain liaison with the Investment Advisory Committee, Canvass Committee, and Fundraising Events Planning Committee. The Finance Committee shall prepare the annual budget for review by the Parish Committee, and be prepared to present the budget to the Parish at the Annual Meeting. The Finance Committee shall hold regularly scheduled meetings, at least once a month, at an announced time and place and shall maintain a written record of their transactions. All meetings shall be open to parishioners. All decisions of the Finance Committee shall be by majority vote of those pre-sent with the provision that a quorum of four (4) members be present at the taking of any such vote. Plans and implements hospitality and social activities. Recruits volunteers to provide the focal point and make coffee for the Sunday service. Maintains the kitchen and its equipment. The Interiors Committee members meet regularly to assess possibilities to enhance the visual beauty and comfort of the interior space of the church. When there is something identified that needs attention, or when an addition such as art work, furniture, rugs, etc. is thought to be a valuable addition, the committee researches quality, quantity, cost, and whatever else is important and helpful for making decisions. The Interiors Committee is responsible for considering gifts and loans within the guidelines of First Parish policies. Our congregation is a teaching congregation. This committee is the team that supports the student minister. First Parish in Bedford strives to be a loving community that provides support and care for each other through both the best and the most difficult of times. Trained and supervised by the ministers and professional lay leaders, the Lay Pastoral Care Team promotes a spirit and means of ongoing care and concern offered within the church community, among peers. Based on the first UU principle, to affirm the inherent worth and dignity of every person, the Lay Pastoral Care Team provides a readiness to reach out, listen, and support everyone in our community. If you or someone you care about is in need of support, contact any of the Lay Pastoral Care Committee members or the call the church office at 781-275-7994 to get in touch. 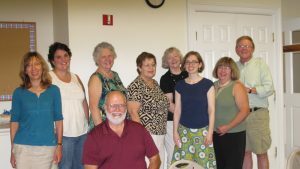 Current Lay Pastoral Care Team Members: Nancy Daugherty (co-chair), Maria Green (co-chair), Bob Batt, Sandy Boczenowski, Liz Hanegan, Marge Heckman, Merry Kassoy, and Susan Lincoln. Although the Lay Pastoral Care Team members do not provide therapy or mental health services, we are mindful of privacy and confidentiality. We are committed to holding information you share with us in the strictest confidence. We ask your permission before sharing information with other members of the LPC team and/or with the ministers. Our intention is to provide the best support possible to you. In any situation where there is an immediate concern about someone’s personal safety, we will talk with you about our need to involve the professional ministerial staff. Challenges come our way in life. Some are pretty manageable. Others leave us feeling very alone and overwhelmed, or demand great contemplation. The Lay Pastoral Care Team is available to offer sustained personal support to those enduring grieving, illness, injury, disability, marital changes, unemployment, relocation, care giving, isolation, job loss, inability to attend church or other difficult life situations. Likewise, times of celebration in our lives, such as a marriage, anniversary, the birth or adoption of a child/grandchild and a new opportunity, may bring stress and the need for acknowledgment and extra support. The Membership Committee welcomes new friends; encourages new, prospective and current members to participate in the life of the Parish; provides orientation and integration of potential members through communications and programs; and leads parishioners as a welcoming community. The Music Committee (MuCom) supports the Music Department staff, promotes excellence in our music programs, and conducts several music fundraising events each church year. Staff support includes assisting in annual budget planning, evaluation of music programs, performing searches for vacant staff positions, and acting as vox populi in dealing with issues involving msical life at First Parish. It should have as members no fewer than five parishioners that represent the musical interests of the congregation, in addition to the Music Director/Choir Director, Youth Choir Director, and Accompanist as ex officio, non-voting members. For information on First Parish’s music programs, visit the music section of this website or email music@uubedford.org. The purpose of the Partner Church Committee is to support the relationship between First Parish in Bedford and our partner church in Abasfalva, Transylvania (Romania). The committee actively supports First Parish’s membership in the Abasfalva Association (comprised of the Unitarian church in Abasfalva, the Landowner’s Association in the village, and First Parish in Bedford), and in the Unitarian Universalist Partner Church Council which promotes connecting Unitarian and Universalist congregations around the world. The Peace & Justice Group’s mission is to study, educate, and take action upon social justice and peace issues pertinent to our Unitarian Universalist values. Additionally this group works to promote the social justice campaigns of both the UUSC and the UUA’s Congregational Study Action Issues and Statements of Conscience. To monitor and report on the implementation of policies and programs. Consult with the individual Ministerial Relations and DRE Relations Committees from time to time. The Personnel Committee will consist of three members, experienced in the management of church matters at First Parish and demonstrating strong capabilities in the personnel management area. Members will be appointed and serve at the convenience of the Parish Committee. The Physical Plant Committee plans and supervises the maintenance, repair, and improvement of the church, the parsonage, and grounds of each; supervises maintenance of equipment and fixtures of each. It proposes long-range plans for the maintenance and enhancement of the properties to the Parish Committee and the Parish, and works with the Parish Committee on capital budget planning. In conjunction with the Director of Religious Education, the committee plans, organizes and coordinates a general program of religious education for children and youth. It recruits, trains, and provides support to volunteer teachers, and provides curricula and other materials needed. Members serve as liaisons to specific grade levels and/or interest groups that are consistent with the mission of the Religious Education program. To maintain visibility of the Safe Congregation Policy of the First Parish in Bedford. To investigate and facilitate resolution of problems, issues, and complaints of noncompliance with the Safe Congregation Policy. Three to five adults plus a minister and/or DRE; terms three to five years. Appointed by the Parish Board. Meets on an as needed basis. Communicate with the First Parish community regarding the availability of the Safe Congregation Policy so as to inform newcomers and remind the First Parish community of the policy. Hold in confidence all problems, issues, complaints, and outcomes, unless it is deemed necessary and important that the larger First Parish community should be informed. Provide information on how a parishioner would report a concern related to the policy. Develop/review the policies and procedures on how the Response Team will guide the process for accepting and resolving complaints. Conduct an annual review to ensure propriety of content and continued relevance of the Safe Congregation Policy and the procedures of the Response Team. Recommendations for changes to the Safe Congregation Policy will be referred to the Parish Board for approval. Maintain accurate and timely records while approaching a problem and resolution. Inform First Parish staff as needed and keep staff apprised of outcomes. The Senior Minister will be the sole voice for First Parish in Bedford regarding press and other publicity. Offer referrals for professional services when appropriate. The Safe Congregation Response Team will observe requirements for mandatory reporting when applicable. The Safe Congregation Response Team may utilize outside resources when necessary. The Safe Congregation Response Team will make every reasonable effort to maintain confidentiality by disclosing the identity of the individuals involved only on a “need-to-know” basis and as necessary to investigate and resolve the complaint. If there is a complaint or concern involving a member of the Safe Congregation Response Team (staff or non-staff), that person will step down from the Safe Congregation Response Team until the complaint or concern is resolved. Resolution of the complaint or concern may include permanently barring that person from serving on the Safe Congregation Response Team. Please visit the Social Action section of this website for more information. Follow the bylaws in Article VI, section C.2. for a standing committee. In addition, announce the time and place of all regularly scheduled meetings and maintain a written record of all transactions. All meetings shall be open. All decisions of the SRC shall be by majority vote of those present and voting, with the provision that a quorum of five (5) members must be present at the taking of any such vote. Establish, assist, and supervise social responsibility initiatives involving the use of the resources or the name of First Parish. The Council will assess collective goals and resources related to possible social action within the Parish; explore and communicate opportunities for social action in the community at large; and act as liaison between the Parish and other organizations with potential for cooperation in social action. Foster the establishment of Social Action Projects of members of the Parish to undertake projects and programs of social outreach. If accepted by the Council, funds from the Council’s budget may be allocated to accomplish project goals. The Council will report its current slate of Social Action projects at the Annual and Semi-Annual meetings of the Parish. We are all stewards of First Parish, and as such, our role is to take care of our beloved community so that it can continue to make a difference in our lives and those of future generations. The Stewardship Committee works towards bringing our time, talents and treasure together to enable First Parish to fully achieve its four fundamental concepts of spirit, justice, community, and sustainability. Our collective contributions make love real in the world. Read more about Stewardship at First Parish Bedford. While our goal as a congregation is to radically welcome and celebrate all sorts of diversity among us, this committee focuses on LGBTQ issues. The purpose of the Welcoming Committee is to serve the needs of The First Parish in Bedford as a Welcoming Congregation consistent with the guidelines of the Unitarian Universalist Association. We actively welcome gay, lesbian, bisexual, and transgender people as full participants in the life of the church. The committee sponsors educational activities and events through Social Outreach in a way that promotes First Parish and UU values in society while respecting diversity within the Parish and providing a safe space for the GLBTQ communities.